Richard's construction experience started like many young men: building his own tree house in the apple tree next to the family home. After High School, he worked for a year as a laborer on a power plant construction job-site, and worked for a General Contractor to help pay his way through college. Along the way, he has planned and executed a number of personal home improvement projects, ranging from designing and building storage sheds to full-blown bath and kitchen remodels, culminating in the remodeling of a portion of the home basement into his office. His up-close experiences with projects great and small give him an appreciation for the complexities that become part of any project. 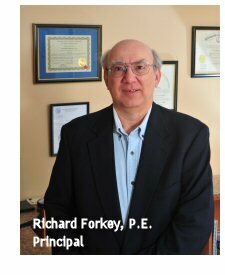 Prior to pursuing his engineering career, Richard worked for 17 years as an assembly welder for a variety of manufacturing concerns, fabricating products ranging from heavy equipment to material handling and sorting machinery, grinding mills for mineral processing systems, and large capacity chillers and air conditioning systems. He is a graduate of The Pennsylvania State University with an Associate Degree in Engineering Technology and a Bachelor’s Degree in Structural Design and Construction Engineering Technology. Following graduation, he worked for a year with the Baltimore Hambro Joist distributor as a designer/estimator. In 1995, he moved to Phoenix, Arizona, and worked there for five years. Two years in Austin, Texas and two and one-half years in the Hampton Roads/Norfolk, Virginia region preceded his move to Asheville in the summer of 2005. 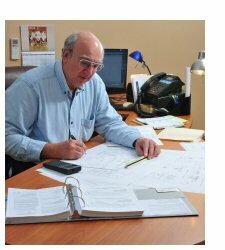 Richard worked for KLOESEL Engineering, PA prior to starting his own consulting firm in the Fall of 2009. Richard's experiences in each of these national regions, ranging from the desert sands of the Southwest to the expansive and/or compressive clays of the Texas hill country to the shores of Virginia Beach and the mountains of Western North Carolina, give him the ability recognize and deal with any conditions peculiar to your project. In addition to unusual soil conditions, past projects have included buildings in areas of moderate seismic activity (Nevada), high snow loads (lakes region of Ohio, and Flagstaff, Arizona), and high winds (coastal regions of Virginia, North Carolina, and Florida). At Twin Hills Structures, our goal is simple: to help Architects, Builders and Owners turn visions and goals into reality. We will work with you throughout the design and construction process to develop innovative, cost-effective solutions to your building problems.